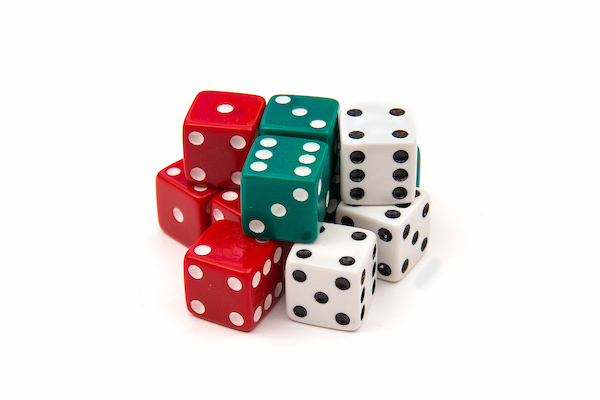 Standard and specialty dice collections. 4-1/2 inch nylon blocks with a clear pocket on each side. Includes 2 dice. Round nylon bag with elastic opening on one end. Approximately 12 inches tall and 6 inches wide. Six, six-sided die. 2 numbered 1-6, 2 numbered 4-9, 1 numbered 0-5, 1 labeled more / less. Six, six-sided die per individual set. This classroom package contains 15 individual sets. Standard 6-sided dice. 12 dice per package in assorted colors. Standard 6-sided dice. 5 dice per package, white. Six-sided dice. 5 dice per package. Numbered 0-5, white. Six-sided dice. 5 dice per package. Numbered 1-6, white. Six-sided dice. 9 dice per package. Numbered 1-6. 3 green and 6 blue.